As more people visit coastal beaches in spring and summer, potential interactions with marine mammals increase. Marine mammals come ashore to rest or recover from injuries. Seal mothers leave their pups onshore for short periods of time while they search for food. While they are ashore, they need to be left alone. If you see a marine mammal on the beach, leave it alone and call the Seaside Aquarium so we can post signs around the animal to encourage everyone to stay away. Do not, under ANY circumstances, touch or move seal pups or other marine mammals. 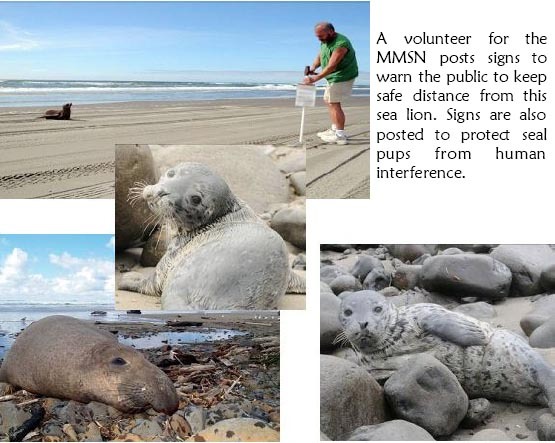 Call 503-738-6211 to report stranded marine mammals , including seal pups, in the area. Seaside�s long sandy beaches have not always existed. At one time, the beach was primarily covered with cobblestones eroded from Tillamook Head. To provide a more comfortable beach setting, sand was actually brought in by the cartload and spread near the Turnaround. The tides would regularly wash it away. In the 1920�s, the jetty was built at the mouth of the Columbia River. The change in water flow meant that sand started being deposited on Seaside�s beach. Before they knew it, residents had so much sand, they were forced to try a number of efforts (including fences and European Beach Grass) to stabilize giant shifting dunes. Today, both the Columbia and seasonal currents affect the sand situation. Sand is deposited on Seaside�s beach in summer when the broad, shallow California current pushes south and then sand erodes away when the fast moving Davidson current pushes north in the winter. The stretch between Seaside and the Columbia River is one of the few prograding (building up rather than eroding) beaches in Oregon.